You don’t need to be a “bad boss” to shudder at the thought of giving negative feedback to an employee. Take a moment and recall your worst supervisor ever. Whenever they gave you criticism, it felt like one of many attacks, right? As a result, your work suffered and so did you. The only way to be a good boss is to have been a good employee, which (likely) also means experiencing what it is like to work for several bosses over a long period of time. Funny enough, the “bad bosses” of the group end up being the ones you remember most vividly. These bosses leave a lasting impression of specifically what not to do when it comes to delivering criticism. To give feedback effectively is to strike a very delicate balance between directly conveying your point without making your employee feel defensive. Feedback is necessary to creating lasting change and, I promise, does not always have to be unpleasant. 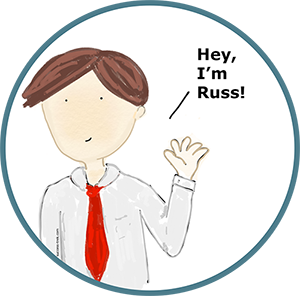 Russ is an imaginary boss (and, simultaneously, an incredibly useful mnemonic device) to help you remember some tips to giving feedback effectively at your next performance review. Relate: Take the time to see the situation from your employee’s point of view. Doing so will help you frame the comments in a way that is useful. Remember – mistakes are almost always accidents and the behavior was probably not intentional. Use facts: Gather details regarding what happened. This way, the feedback is less personal because you have hard facts to back it up. Specify: In order for feedback to be effective, explain how the behavior affects other employees or the company as a whole. If the behavior breaks a rule or policy, explain why your company or organization instituted the guidelines in the first place. Solve: As you wrap up the discussion, state what you hope the outcome will be and/or seek your employee’s input. By being involved and taking ownership of the solution, your employee is more likely to accept the feedback and feel less defensive because you are asking them for input as well. Is feedback making you freeze up? These tips are just the tip of the iceberg—give us a call today to see how we can help! This month’s tip was adapted from an article by Vicki Anderson as it appeared in The Temple Group’s newsletter, Preventive HR.